In 2011, the earliest year for which data was available, at least 29 communities only had a Catholic hospital to rely on for most of their care. By 2016, that number had grown to 45, according to MergerWatch,1 an organization that is opposed to health care providers operating under religious restrictions and tracks how religious doctrine has shaped the U.S. health care system. That’s 10 percent of the 459 hospitals that were classified as the sole hospitals in their community in 2016, according to the database referenced by MergerWatch. Catholic medical care has played an important role in the U.S. for more than a century, though that role has evolved over time. Many Catholic hospitals trace their roots to nuns who came from Europe to serve immigrant communities. They have been, and continue to be, an important source of charity care to the poor. For decades, religious authorities have helped determine what kinds of care can be offered in Catholic institutions, based on theological concepts like the sanctity of human life. But what was permitted and forbidden wasn’t always clear to the nuns running the hospitals, according to Barbra Mann Wall, a historian at the University of Virginia who has studied the evolution of Catholic health care in the U.S. As a result, doctors sometimes had more opportunities to seek exceptions for patients or offer care through loopholes in the system in the past than they do today. Now, the nuns’ role has faded and Catholic bishops preside over hospitals that tend to be part of massive health care networks, where part of their role is to hold the line against procedures the church has forbidden. And they often use a stricter interpretation of religious doctrine — with fewer exemptions for patients — than the nuns once did. Amid those shifts, the number of hospitals following Catholic doctrine has grown all over the country, not just in rural areas. Best estimates suggest that one in six hospital beds and many of the nation’s largest nonprofit health systems are Catholic-owned or -affiliated. From 2001 to 2016, the number of Catholic-affiliated hospitals in the U.S. grew by 22 percent, even as the total number of hospitals in the U.S. shrunk, according to research by MergerWatch and the American Civil Liberties Union. And the changes vary by region. In Washington state, more than 40 percent of hospital beds are in Catholic institutions. In several Midwestern states, more than 30 percent of beds are in Catholic hospitals. There are many reasons for this growth. Hospitals of all kinds have been merging under giant corporate umbrellas, Catholic systems included. Rural hospitals, particularly independent ones, are struggling financially and closing down by the dozens. In some areas, Catholic systems have weathered the financial challenges of the hospital business better than other entities for reasons that seem to be partially explained by their nonprofit status, as well as their general efficiency and solid financial backing, according to experts. The growth in the number of Catholic facilities coincided with a slow push, starting in the 1970s, to create legal carve-outs for health professionals’ moral or religious objections to providing some services. Federally, and in many states, there are already laws protecting the rights of individuals or institutions to refuse services based on their ethical and moral beliefs. When it comes to prescriptions for birth control, in six states, pharmacists don’t have to fill them; in nine states, doctors don’t have to write them; and in eight, hospitals don’t have to provide them, according to the Guttmacher Institute, a research group advocating for sexual health and pro-choice policies. These laws protect clinicians who want to refuse treatment, but there is little recourse for clinicians in the opposite scenario — those who want to provide care that a religious employer has forbidden. In many cases, religious exceptions are enshrined in law but a right to standard medical care is not, said Susan Berke Fogel, a director at the National Health Law Program who specializes in reproductive health care. She finds that troubling, because religious exemptions are just that: exceptions to standards that were set by the medical profession to ensure that doctors are giving patients the best possible care. “What [religious hospitals] are getting is permission not to meet those standards,” said Fogel. And yet, hospitals are generally not required to let patients know what services they do not provide. In rural communities served by a dwindling number of hospitals, those exceptions can mean that certain types of standard care aren’t available at all. Debates over religion and health care often center on abortion, but abortion is relatively rare in the hospital setting. The Ethical and Religious Directives, a set of guidelines established by the U.S. Conference of Catholic Bishops that govern what kinds of care Catholic hospitals can provide, explicitly ban the procedure, but when patients are denied care as a result of the directives, it’s more likely to involve other a treatments, like a tubal ligation or birth control access, than abortion. Health providers working for Catholic facilities aren’t allowed to provide birth control for the purpose of preventing pregnancy.3 This means that in addition to birth control pills and long-acting contraceptives like the IUD, Catholic facilities generally forbid tubal ligations (commonly called “having your tubes tied”) and other forms of permanent sterilization. As many as 40 percent of women don’t come back for a postpartum visit with their OB-GYN, so if the hospital where they deliver their baby won’t offer contraceptive procedures or devices, they may not have a second opportunity to easily get long-term contraception. “We’ve lost them, and then they can’t get that care,” said Dr. Kathy D. Hartke, a retired OB-GYN who is the legislative co-chair for the Wisconsin section of the American College of Obstetricians and Gynecologists. Doctors and patients can sometimes petition Catholic hospitals’ in-house ethics committees to make exceptions when they believe the situation is extreme, but these are granted on a case-by-case basis. Several doctors who work or have worked at Catholic institutions told FiveThirtyEight stories about times that, due to their employers’ religious restrictions, they couldn’t provide patients with what they considered to be the best treatment available. Most spoke on the condition of anonymity out of fear they would be fired or sued. Dr. Katherine Kaplan, an OB-GYN who retired from the Marshfield Clinic in northern Wisconsin and now works as a traveling doctor, and her former colleague Dr. Joseph Welter, who still works at the clinic, were willing to be named. That’s partly because they both have vivid memories of patients who they believed needed care they weren’t allowed to offer. Though Dr. Kaplan and Dr. Welter worked for a non-religious clinic, the hospital where most of their patients delivered their babies — the only hospital in the area — was Catholic. When the hospital moved to secular owners last year, the Catholic restrictions on reproductive health care were lifted, making it easier for both doctors to speak on the record. During the first half of her decade-long tenure in Marshfield, Dr. Kaplan said there were essentially no restrictions on the care she could provide, other than abortions, which weren’t allowed. Halfway through her time there, she said, the local bishop adopted a stricter policy and suddenly she wasn’t allowed to do tubal ligations after a C-section or prescribe contraceptives. “It was at best intrusive, and at worst life-threatening,” Dr. Kaplan said. Soon after the change in policy, both doctors recall being formally reprimanded for performing tubal ligations during emergency C-sections in the hospital. There were other patients who, as a result of the policy changes, couldn’t receive birth control, even when their health could have been endangered by getting pregnant again. Dr. Kaplan remembers one patient who wanted to have her tubes tied but couldn’t get the procedure done because of the hospital’s policy. The woman ended up getting pregnant again within months, with a pregnancy so complicated that the patient had to make over 100 doctor visits and ended up delivering two months early. Marshfield’s new owners declined to comment on the hospital’s policies under previous ownership. Dr. Kaplan considered leaving the Marshfield clinic at times, but she didn’t want to leave her patients behind. “I went into obstetrics because when I was picking a field [in the 1980s], women’s health care was dominated by men and women had very little voice,” she said. Physicians organizations, including the American College of Obstetricians and Gynecologists, have expressed concern that the growth in Catholic systems is impeding the availability and quality of reproductive care. And the American Civil Liberties Union has worked on numerous lawsuits and complaints in a variety of states alleging, among other things, discrimination against women and transgender people as a result of these exemptions. The California Medical Association, which represents 43,000 physicians, tried to intervene in a California lawsuit over a denied tubal ligation. At the time, its president-elect said the group made the move because patients and physicians — not hospital administrators — should be the primary decision-makers when it comes to health care. 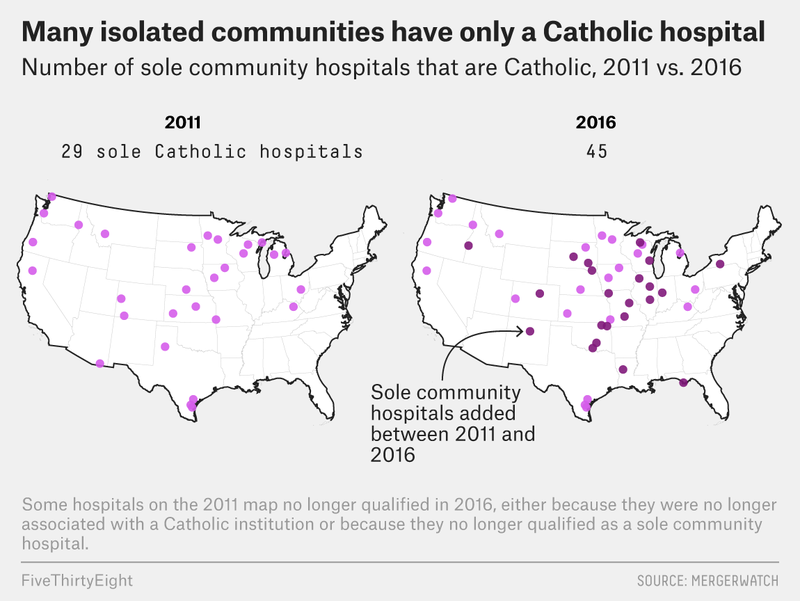 The map of Catholic sole community hospitals above is just one way of measuring how geography can funnel people into Catholic care. Muskegon, Michigan, made headlines two years ago after Faith Groesbeck, the county coordinator for a federally funded program designed to reduce infant and maternal mortality, spoke out about what she believed were concerning patterns of care. She documented five instances where women who visited the town’s only hospital, which is Catholic, were subjected to prolonged and risky miscarriages without being informed about alternative options. The hospital those women visited is not categorized as a sole provider because there is another hospital less than 35 miles away. But in an area where more than half of births are covered by Medicaid, many low-income women are limited by finances and distance when it comes to where they can give birth. And that’s the problem, say many physicians, lawyers and medical groups, with relying only on the map above to understand how patients can be functionally restricted to Catholic care. Wealth, health insurance and a host of other issues can restrict patients’ choices. In some ways, geography is the most visible and measurable barrier that patients face when they look to receive standard medical care, but it may not even be the most common. In the coming weeks, FiveThirtyEight will be exploring other ways in which patients are funneled into Catholic health systems and what that means for people who want or need care that doesn’t conform with the bishops’ guidelines. CORRECTION (July 25, 2018, 10 a.m.): A previous version of this story incorrectly described Walla Walla, Washington, as in the southwestern part of the state. It is in southeastern Washington. Using the Definitive Healthcare database, MergerWatch pulled a list of facilities categorized as sole community hospitals, a federal designation for hospitals that are at least 35 miles from the next-closest equivalent hospital, or that are otherwise deemed geographically isolated. That designation in the Definitive Healthcare database was taken from Medicare cost reports. From there, MergerWatch researched which hospitals had a Catholic affiliation. FiveThirtyEight has confirmed that all hospitals appearing on this chart are members of the Catholic Health Association or adhere to the Ethical and Religious Directives of the U.S. Conference of Catholic Bishops. They first did this for 2011, which was published in a report with the ACLU; this year, they accessed the data for 2016, the most recently available year. It’s possible that there are sole community hospitals following these directives that don’t appear on the list. This list does not include hospitals that are affiliated with other religions, even if they do not provide certain services due to religious objections. According to the Ethical and Religious Directives, a set of guidelines established by the U.S. Conference of Catholic Bishops, Catholic hospitals are generally not allowed to offer contraceptives, including tubal ligations and vasectomies, if the goal is to prevent pregnancy. Emergency contraception is also forbidden, except in cases of sexual assault where it can be proven a pregnancy has not begun. The directives also restrict the use of in vitro fertilization for women with fertility issues. And the standard treatment for ectopic pregnancies is not allowed, nor are certain kinds of miscarriage management, in both cases because the procedure is considered tantamount to abortion. Some Catholic hospitals have also declined to provide certain health care to transgender patients. Many contraceptives can serve other purposes, like controlling excessive bleeding, regulating periods or reducing reducing acne. Catholic hospitals sometimes allow their doctors to prescribe contraceptives for these alternative uses. The nun was later reinstated.